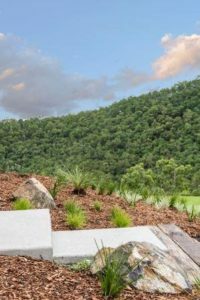 At North Brisbane Trees we pride ourselves on supplying our customers with the best Forest Mulch for sale in Brisbane! We can also help with Mulch Spreading if required. We all know the benefits of mulch are weed suppression, moisture retention, increased beneficial soil micro-organisms, root zone temperature regulation and, of course, it looks great. But not all mulch is the same. Read below to find out what makes ours the best. It’s not free mulch but it’s the best quality and worth every penny. So what exactly is “Forest” Mulch? Forest Mulch is a term the landscaping industry has given to the product derived from domestic tree pruning and tree removal, and is made up of whatever tree workers feed into chippers while carrying out tree work, ie wood chip and leaves. 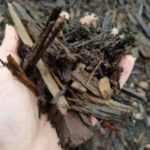 There are FOUR main factors that contribute to us having the best mulch sales in Brisbane and it starts with material selection. Living in a sub-tropical climate such as Brisbane, a large portion of the work carried out by tree workers is palm removal and cleaning. Unfortunately, palm fronds go through the chippers almost fully intact and therefore, make the mulch unattractive and difficult to spread. Most of our competitors operate from small yards and even from suburban house blocks, and have no option but to sell their mulch with palm remaining. Our depot is based out of Samford on 40 acres, allowing us to dispose of and keep out most of this palm mulch. Forest Mulch has been processed through a wood chipper with sharp blades cutting up tree material into small chips of wood. Our Aged Forest Mulch is this product which has been left to age or “cook” as we refer to it for three months prior to selling. During this cooking process, our mulch will reach temperatures well above 70 degrees even in the middle of winter! It is also turned over several times. Fresh Forest Mulch contains tannins which are extremely harmful to young plants and even mature trees. Fresh Forest Mulch will absorb valuable nitrogen from your soil – properly aged forest mulch will not. Throughout this 3 month process, harmful tannins are leached from the mulch and unsightly leaves are turned into compost. The end result is a product which has a pleasant earthy smell and feel, allowing your plants to simply flourish! 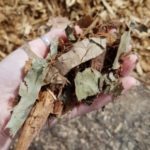 Fresh Mulch is exactly the same product as our Aged Forest Mulch but hasn’t gone through the 3-4 month long composting process. This product is not suitable to be spread near juvenile plants or stressed trees and shrubs. Our Fresh Mulch is sold in 2 different ways; Option 1 – We use our loader at our depot to load the truck and the product is delivered at your preferred time and date. With this option the above mentioned delivery fee applies. Option 2 – We supply the product directly from a tree job. With this option there is no delivery fee but we will only deliver the product when we’re in the area and when we happen to have the correct quantity. With this option there could be a wait period of up to 3 months and we need to be able to deliver the product without any notice which may mean you would not be home. This option is usually only suitable to a small minority of our customers. 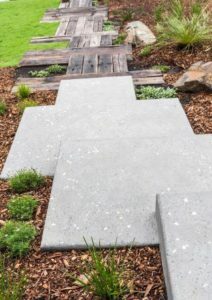 Grinded Mulch has been processed through a 30 tonne horizontal grinder that GRINDS up logs, tree stumps / rootballs (for this reason there is often a small amount of soil material mixed through), lawn clippings, palm material, bamboo, shrubs, ground covers, etc. This is the product you often see when at the local tip. Our Grinded Mulch is AGED for a minimum of 6 months and is fantastic for the soil and therefore for vegetation. It’s biggest down side is that it isn’t as attractive as the Forest Mulch as it does contain some fairly coarse material and therefore doesn’t have the consistency that the Forest Mulch has. Forest Mulch is process with a CHIPPER with sharp blades, whereas Grinded Mulch is essentially pulverised as opposed to being chipped. We can deliver our top quality Aged Mulch whenever you want it. Before we purchased our loader, we used to sell Fresh Mulch directly to customers and landscaping yards like all the other tree companies do. The issue with this way of operating is we could never guarantee the time of delivery, let alone the date, as it would all depend on WHEN the truck was filled and WHERE! This resulted in disappointed and often angry customers. But not anymore! It takes over 1 ½ loads of Fresh Mulch to make 1 load of our Aged Mulch. While we’ve never actually weighed the two products, all our drivers will tell you the Aged Mulch is a lot heavier, giving you much better value for money. Despite all the handling that goes into making our mulch, it’s still only marginally more than the green stuff from our competitors. We sell our mulch for a per m3 inc GST rate plus Delivery Fee. The delivery fee is based on the number of Km’s from our Yugar (Samford) depot, for example, if 5Km’s from our depot the delivery fee would be $55 Inc GST, if 15Km’s from our depot the delivery is $105 Inc GST, and if 25Km’s from our depot the deliver is $155 Inc GST. We can load whatever quantity you like. 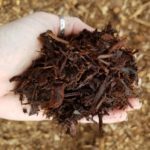 Is the Forest Mulch from landscaping suppliers better than your mulch? NO!! Landscaping yards are SOLELY supplied with Forest Mulch by tree workers. You’ll get whatever rubbish went through the chipper that day. Don’t risk it! Our mulch is the best mulch you will find anywhere in Brisbane, guaranteed. Does North Brisbane Trees do mulch spreading? Absolutely! Give us a call on 07 3289 3610 and we’ll come out and give you a free quote to spread our top quality mulch for you. Contact us on (07) 3289 3610 to discuss buying mulch from North Brisbane Trees. And remember you can also talk to us about tree lopping and tree trimming.